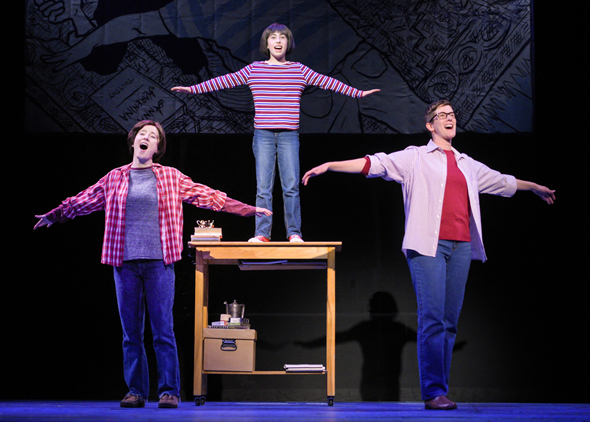 Erin Kommor as Medium Alison, Ruth Keith as Small Alison, and Moira Stone as Alison, from left, remember playing airplane with their dad in "Fun Home," staged by TheatreWorks Silicon Valley, October 1-28, 2018, at the Mountain View Center for the Performing Arts. 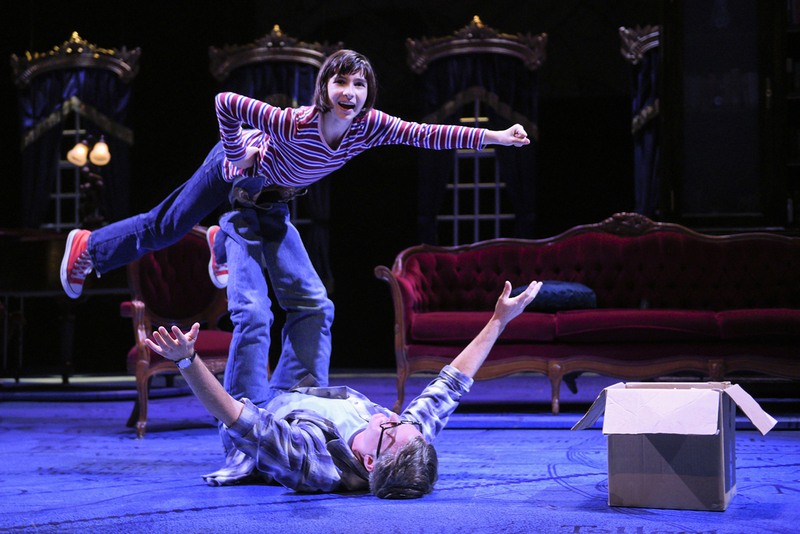 "Fun Home," a finely crafted musical that tells a meaningful story of familial love and tragedy in very clever ways, is getting a charming staging in Mountain View thanks to TheatreWorks Silicon Valley. It is based on a graphic memoir by cartoonist Alison Bechdel, that tells of her own joy at discovering she is a lesbian, contrasted with her gay father's experience in the closet. The generational difference means everything. In her father's day — when she was a young girl — it was dangerous to be openly gay. By the time Alison was in college, the acceptance of gay lives was much more open, making her life so much easier than her father's. Lisa Kron's book and lyrics use three Alisons to tell the story, sometimes with all three on stage at the same time. Adult Alison — the established cartoonist looking back on her life and narrating — Small Alison (the youngest version), and Medium Alison, who fully embraces being a lesbian while in college. Just four months before her father kills himself. The music, by the great Jeanine Tesori, is charming and catchy, soothing the audience through the story and even leaving a few ear worms to help it be remembered. Small Alison (played by Lila Gold or Ruth Keith) shows the audience a child's view of her father Bruce's exquisite home, and the fights between Bruce and his wife. Bruce is played with considerable presence by James Lloyd Reynolds, who makes real the man's swings between stolid responsibility and his bursts of temper. Crissy Guerrero plays Small Alison's mother, Helen, who is at turns mystified by Bruce's behavior, and angered by it. Small Alison gets to play with her brothers, Christian (Jack Barrett or Dylan Kento Curtis) and John (Bill Hutton or Oliver Copaken Yellin). A favorite bit? 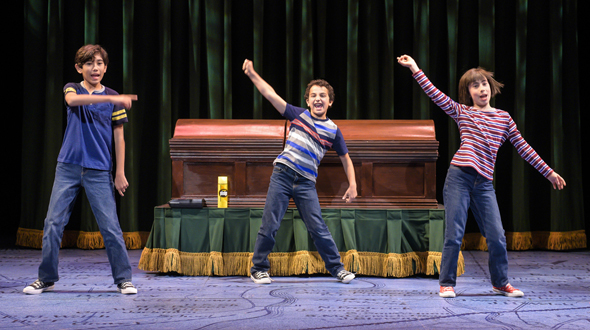 When they play in a coffin at the Fun Home, where Bruce works part time as an undertaker. Choreography by Dottie Lester-White makes this scene, and others, delightful. Adult Alison, on stage all the time, wanders through any scene, perhaps picking up a drawing Small Alison is making, and commenting on what it meant to her. Bruce interacts with a series of young men (all played well by Michael Doppe), and it's clear that he is gay. One of the young men mentions having met "married men like him" before. Bruce stays busy, as a teacher, a home restorer and as a part-time undertaker, but his increasing unhappiness is palpable. He seems horrid to his wife and even to his children for seemingly no reason. Meanwhile, Middle Alison goes off to college, where she discovers that she is, indeed, what at first she denies: She is gay. Once she has a mouth-to-mouth encounter with Joan (an appealing Ayelet Firstenberg), she becomes a very happy lesbian. The cast is excellent throughout, making every character real, human and recognizable. A fine job of direction by Robert Kelley. This production is elegantly polished, delivered on a handsome set designed by Andrea Bechert, with sections that elevate up and down from the flies, or slide in and out from the wings. Lighting by Stephen B. Mannshardt helps it all work. Tesori's music is beautiful, making the funny stuff funnier and the emotional stuff more touching. It is delivered by an excellent, seven-piece orchestra in the pit, directed by the always excellent William Liberatore. 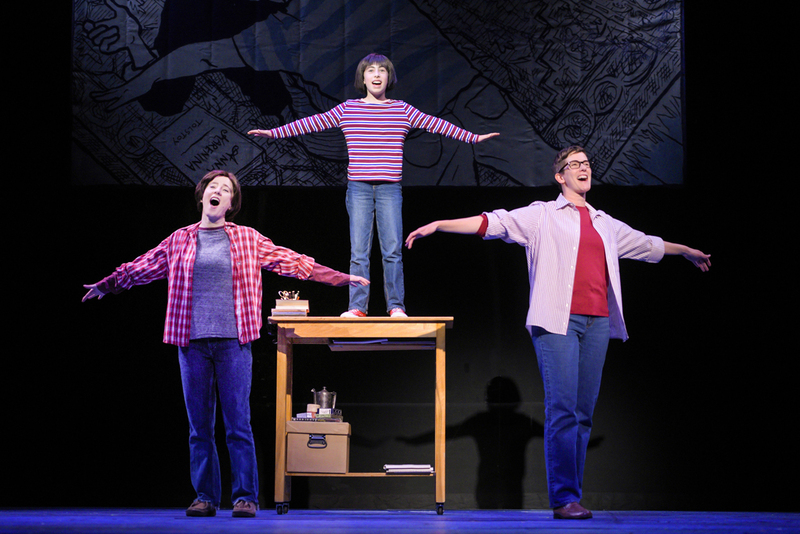 "Fun Home" deals very honestly with the tragedy of the father's life and death, but leaves us with hope for Alison's happiness. It is a reminder of how far society has evolved, at least for that one issue. Lila Gold, top, as Small Alison, who feels like Superman as she plays airplane with her father Bruce (James Lloyd Reynolds) in "Fun Home," presented by TheatreWorks Silicon Valley October 1-28 at the Mountain View Center for the Performing Arts. The Bechdel children, Dylan Kento Curtis, Oliver Copaken Yellin, and Ruth Keith, from left fantasize a commercial for their family-owned funeral home in "Fun Home," presented by TheatreWorks Silicon Valley October 1-28, 2018, at the Mountain View Center for the Performing Arts. The choreography for this scene is a lot of fun. 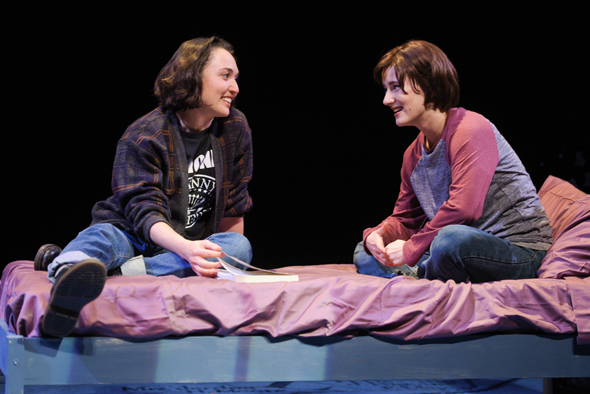 Ayelet Firstenberg as Joan, left, helps Medium Alison (Erin Kommor) learn to be happy about being gay in in "Fun Home," presented by TheatreWorks Silicon Valley October 1-28 at the Mountain View Center for the Performing Arts.